More than 220,000 people are diagnosed with lung cancer each year in the U.S., according to the American Cancer Society, and lung cancer screening is the best way to identify risk factors for the disease long before symptoms ever occur. 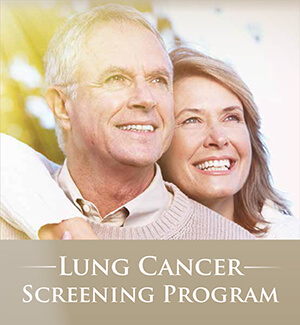 The screening procedure uses low-dose computed tomography (LDCT) to scan the chest and look for changes in the lung tissue as well as other biomarkers associated with lung cancer development. LDCT uses up to 90 percent less radiation than standard CT exams, yet it's accurate enough to detect a wide array of abnormal changes, making it a safe and highly effective screening technique for men and women at an increased risk for developing lung cancer. When a lung cancer screening test reveals abnormalities, it can help your healthcare provider determine a course of preventive care and monitoring that can help decrease your risks of developing lung cancer as well as the risks of dying from the disease. When is lung cancer screening used? have a chronic lung disease or another cancer related to smoking. Even though lung cancer screening uses low doses of radiation, it still may not be a good choice for people with specific types of medical conditions or for women who are pregnant. What happens during lung cancer screening? Prior to the screening procedure, you'll be asked to remove metal jewelry, eyeglasses or other items that may contain metal, and you'll probably need to put on a hospital gown. During the scan, you'll lie on your back on an exam table that will slowly move you through the CT scanner. The CT device uses a revolving x-ray scanner that moves around your body to create multiple images which are sent to a computer for processing. Software helps turn these individual images into highly-detailed three-dimensional pictures of your lungs and chest cavity. As the table passes through the machine, you'll need to hold your breath to keep your lungs still and ensure the images are as clear as possible. The scan takes just a few moments, and the entire procedure takes less than a half hour. Afterward, you'll be able to resume your regular activities right away. We understand that the thought of having to undergo an examination can be stressful and build up unwanted anxiety. At Radiology Affiliates Imaging, our goal is to make every visit comfortable and relaxing for all of our patients so we've incorporated visual therapy and nature imagery at both of our imaging facilities. The ceilings of our CT and MRI suites resemble the skies of spring, transforming the rooms into spaces of natural beauty and freshness. The idea of nature imagery, a form of visual therapy, helps you relax during imaging procedures. The minute you enter our suite, you will feel at ease and therefore eliminate anxiety. There is no special preparation for this exam. You may be asked to change into a gown. Bring your prescription and insurance card. Bring all previous imaging/radiology studies and reports (that were not done at RAI) relating to your current study. For additional Information please call (609) 585-8800 and press 5.